Findings are all the little bits of metal that we use alongside beads. 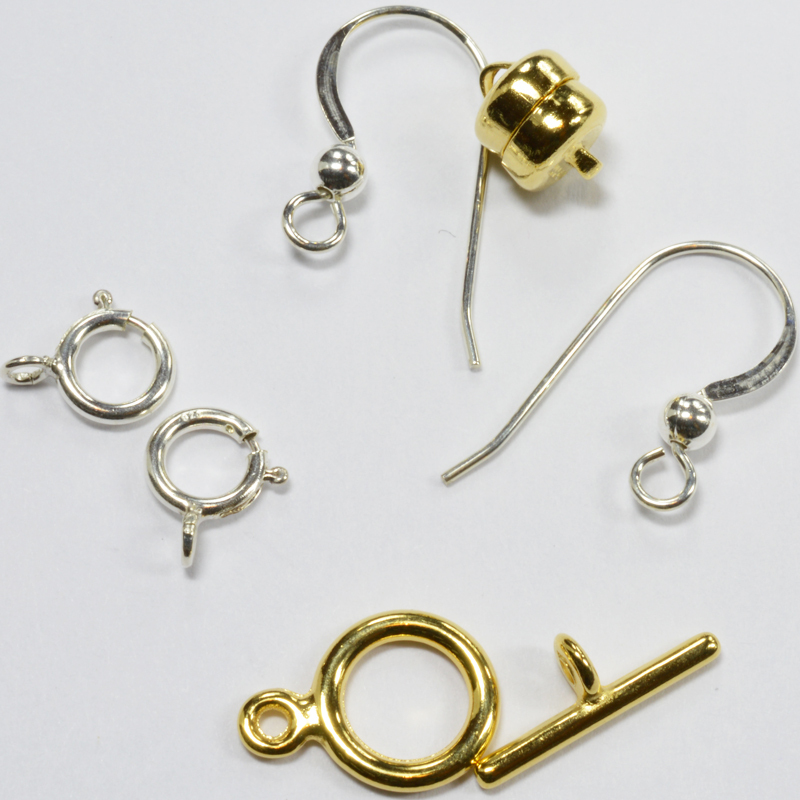 They include clasps, earring backs, pins and the various rings that can be used to join components. When I started out I think this was one of the most confusing areas – standing in a shop faced with a rack of bags of tiny metal objects with strange names was a bit daunting to be honest! I could recognise the basic clasps from the jewellery that I owned and I had some kind of inkling about what I might do with a ring, but I had no idea when to use a jump ring versus a split ring, or even how to tell the difference between these mysterious items. As for calottes and crimps, well, what on earth were they and why would I want to use them? I soon discovered that there are a huge variety of different clasps and they all have slightly different properties making each variety more or less suitable for any given project. If you want to find out more about that, then visit the clasps category from this page’s menu. Everything else is explained under the heading ‘Other Findings’. Just one quick general rule on findings: most of these are available in precious metals (sterling silver, vermeil – gold on sterling silver) or plated metals. As you have probably already guessed, the precious metal versions are more expensive. However, if you are planning to sell jewellery, I would advise always splashing out on the precious metal. A lot of people have allergies to nickel and this is often used in the plated metal versions. Also, I find that precious metal findings tend to last longer and wear better…there is nothing more disappointing than buying a beautifully crafted necklace from someone and then having the clasp break after a couple of weeks – it can render the necklace useless – so make sure you’re not the person selling that jewellery with cheap clasps! Take pride in what you are making and remember that the findings are just as important as the beads and the stringing materials. Just one quick word of warning – there are a very few unscrupulous people out there who are happy to claim that findings are made from a pure metal and thus charge a price that reflects this, when in fact they are selling something actually made from an alloy. I have noticed that all my sterling silver findings, no matter how tiny, have a little hallmark to indicate that they are sterling silver, so look out for this if you are unsure. I must stress though that the vast majority of sellers are perfectly honest and sell extremely high quality products – this is just a tiny point to bear in mind.